Yūrei are a type of Japanese ghost, usually female (though males do exist), traditionally shown as wearing all white with long black hair that hangs in front of their face. They are typically bound to specific places or objects, and often have a mission of vengeance. Yūrei have been featured in such movies as The Grudge, The Ring and Silent Hill in the U.S., which unfortunately led to some confusion among U.S. audiences that the characters were somehow the same in each of the movies. Western audiences were not familiar with the look of the Yūrei, which share very little in common with the “transparent man in a sheet” type of Western ghosts. As J-Horror remakes continue to be made, it’s likely that American audiences will eventually learn to accept the look of this new type of ghost. Yūrei are often Onryō, a ghost seeking vengeance and tied to the physical plane by strong emotions, usually anger. 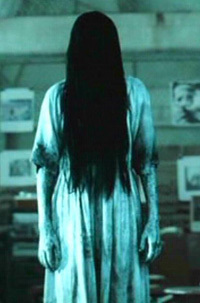 Kayako from The Grudge (seen above) is a perfect example of Onryō. Samara Morgan (or Sedako) of The Ring would also be an Onryō, but while she does thirst for vengeance, she seems to have transcended the traditional role of the vengeful spirit to become more of a plague-like being bent on the destruction of all who watch her tape. This is not quite in keeping with the Onryō. Yūrei typically arise from murders or suicides, especially when the victim is either killed due to jealousy or committed suicide because of family pressures. If a reikon (Japanese for soul or spirit) becomes obsessed with anger, sorrow or jealousy, they may cross back into the physical world and become Yūrei. Women are most frequently depicted as Yūrei because most Japanese consider them far more emotional than men and thus more likely to experience the deep emotion needed to become such a vengeful spirit. Unlike Western ghosts which may have limited ability to interact with the physical world, Yūrei seem to have no problem passing through the boundary between the land of the dead and the living. Western ghosts are also often susceptible to exorcism, while Yūrei often can never be truly defeated or banished. Yūrei rarely desire to communicate with the living, and they are often less concerned with frightening someone as they are outright killing them. Yūrei curses are often so potent that even those who had nothing to do with their vengeance are pulled into the curse and punished – they are indiscriminate killers. A common theme with Yūrei is prehensile hair. The ghosts are often heralded by hair appearing in drains or from victims’ mouthes. Many Yūrei also seem to have a connection to their hair, as items belonging to them will often be found with tufts of hair still attached. A lock of hair from the Yūrei’s physical body may even be enough to hold it at bay for a time. The Yūrei’s hair will also often be able to change length at will, growing or shrinking as needed. This distinctive feature is actually a reference to the way ghosts were portrayed in traditional Japanese theater – the actor would wear a long wig to hide their face. As ghosts, Yūrei can often bend or completely ignore the traditional physical laws. They are often shown crawling along ceilings or walls in defiance of gravity, and can move with extreme speed, crossing distances in the blink of an eye. They often move in a strange, disjointed manner, holding their arms at odd angles or even running on all fours. As a Yūrei is not bound to the physical plane, they can be solid or completely immaterial as they wish, and can vanish instantly. They do often have a precursor, a smell or sound that can alert a potential victim of their approach, but this can be different for each Yūrei. The features of a Yūrei can also change, and they can assume the form of a victim’s loved ones or can become a horrific corpse. Black veins are a common appearance on the pallid faces of the ghosts, and they can often stretch their features in inhuman ways, usually creating giant maws or melting, disgusting faces. The Yūrei can also often create illusions, making a victim believe they are somewhere else or that something impossible is happening (such as a room crashing around them only to be back to normal a second later). While they don’t precisely have control of time, they can hypnotize a victim into thinking more or less time has passed than really has, making day turn to night seemingly instantly. Of all the ghosts of the world, Yūrei are some of the most dangerous. They cannot be reasoned with, contained or destroyed, and often they cannot be banished by any means. They have near unlimited power in meting out their curse and often will punish anyone and everyone who gets in their way. They act more as a force of nature than a simple vengeful spirit, like a tsunami of evil compared to the simple thunder storm of Western ghosts. One method of dealing with Yūrei is through the use of ofuda, a Shinto talisman (sometimes called “prayer sheets” or “prayer tags”). An ofuda dedicated to a specific kami (a spirit, often a deity) can be placed on a door to keep a Yūrei out, or if placed on the Yūrei’s forehead, can banish the ghost. However, this is only practical if the kami indicated in the ofuda intervenes, which may not be the case if the Yūrei’s vengeance is righteous. Some Yūrei can also be exorcised by fulfilling their curse, such as revealing the truth of a spouse’s affair or laying their body to rest in consecrated ground. However, Yūrei can be quite clever and can often mislead a victim into thinking they are helping to banish the Yūrei when in fact they are simply making it easier for the Yūrei to seek its vengeance. The concept of the Yūrei is not isolated to Japan. In addition to the recent American movie remakes, the Yūrei is also prevalent in Korean horror stories. This may be because in Korea, ghosts are often not considered evil or frightening, and instead are looked upon as just another sort of spirit. The idea of a truly evil, and yet potentially righteous, ghost is something of a fascination in such a culture. Korean Yūrei often deviate from Japanese Yūrei in their depiction, as the Koreans are not as bound by the theatrical tradition that gave birth to this type of ghost. Korean Yūrei might have short hair or all black skin, or may appear to be completely normal until they strike. Just a clarification here, the film Sick Nurses is Thai, not Korean. The yruei is actually a slightly tamer version of the onryou, the yurei tends to only go for the person who wronged them or to give them a scare. This is more of a description of the onryou (easily mistaken took me a while to figure them both out). Pingback: Japanese Spirits – The Yūrei! So theres no way to actually destroy or stop a yūrei besides ofuda which only banishes it. For how long? Or laying its remains to rest, which often leads to further harm. Let’s not forget everyone’s favorite little scissor-weilding girl in the red dress, from Heavenly Host Elementry School, Sachiko Shinozaki, & her mother Yoshie. Was the Chen girl in AHS Roanoke supposed to be a yurei?